← To those in Colorado…. I don’t post pictures of myself often, but this time I will make an exception as I am quite proud of this outfit I put it together entirely on a last-minute whim. The skirt was in my closet, part of a previous pirate costume, the bodice had been purchased last year and was worn occasionally for various ren faire costumes, but what brought it together was that jacket that I found on Thursday at the Goodwill. That was a wonderful find. The umbrella was also found at Goodwill, but when I found it was a normal large black umbrella, I spent part of Thursday and Friday ripping out panels and adding new ones to give it an appropriate parasol type look (and for someone who doesn’t sew, I was impressed). The hat was made by my husband out of an old alarm clock. Steampunk is a genre that originated during the 1980s and early 1990s and incorporates elements of science fiction, fantasy, alternate history, horror, and speculative fiction. It involves a setting where steam power is widely used—whether in an alternate history such as Victorian era Britain or “Wild West“-era United States, or in a post-apocalyptic time —that incorporates elements of either science fiction or fantasy. Works of steampunk often feature anachronistictechnology, or futuristic innovations as Victorians might have envisioned them, based on a Victorian perspective on fashion, culture, architectural style, and art. 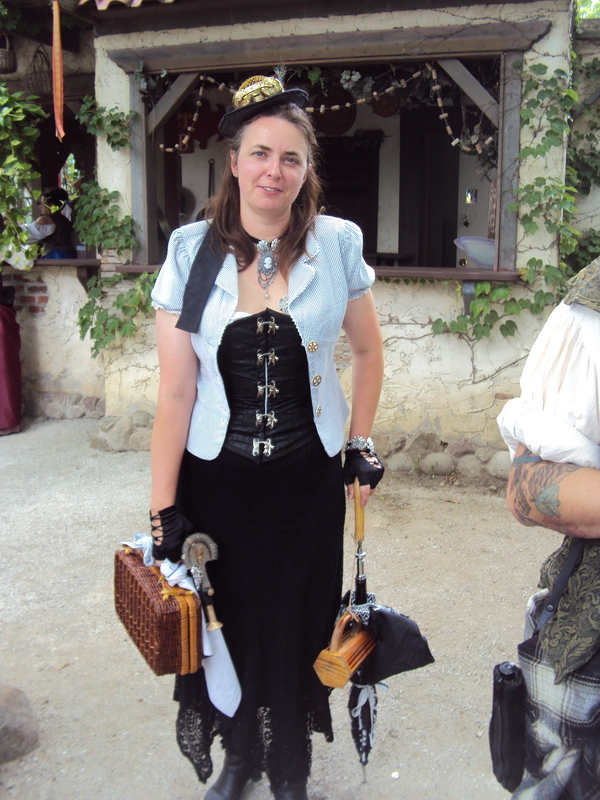 It was steampunk weekend at the Bristol Renassance Faire. For those of you interested in Steampunk then I suggest you check out the work of Highwind Steamworks, my friend Jeff and his wife Dawn make some excellent steampunk gear, you can also subscribe to their Facebook page. Awesomely cool! Thanks for sharing! Hope it wasn’t a 100 degree day at the Ren Fair! Pingback: Goths Should Consider Learning About Steampunk « Lavoce: We Are People Too, Inc.